Since turmeric contains only 2-9 wt% of curcuminoids, a efficient extraction or synthesis technique is necessary to obtain a medically potent powder. Ultrasonically assisted antisolvent precipitation is a highly efficient method to synthesise curcumin particles. The ultrasonic antisolvent precipitation can be easily scaled-up to the production of large quantities of high-quality curcumin. Curcumin, a polyphenol, is a poorly water-soluble drug found in the herbal spice turmeric (Curcuma longa). It has highly potent antioxidants and is known for its anti-inflammatory, anti-cancer, anti-fungal, and antimicrobial properties. Especially for its wide range of chemo-preventive and chemo-therapeutic activities, curcumin is used as a preferred drug compound. As a potent antioxidant, curcumin increases the serum activity of antioxidants such as superoxide dismutase (SOD) and scavenges and neutralizes free radicals such as reactive oxygen and nitrogen species (ROS and RNS). Furthermore, it enhances the activity of the body’s own antioxidant enzymes. Curcumin is also known to lower heart diseases and to improve the brain function. Due to these manifold beneficial medicinal properties, curcumin is widely used as spice, supplement and drug. The ultrasonically-asstisted liquid antisolvent (LAS) precipitation is a simple and rapid one-pot synthesis technique to produce curcumin nanoparticles with orthorhombic superstructure. The ultrasonic anti-solvent precipitation is a simple, fast and scalable process, which allows for the precipitation of high-quality curcumin in the pharma and food industry. Hypothesized mechanism of formation of curcumin superparticles in the absence and presence of ultrasound without stabilizers. Picture © 2014 Thorat et al. For the ultasonic precipitation of curcumin particles, an organic solution of curcumin in ethanol (5 mg/mL) is added into 100mL water containing surfactant (0.02 wt% in water) or without surfactant. As reaction vessel, a jacketed glass vessel of approx. 500mL volume, 7cm diameter and L/D ratio of 1.7 is used. The temperature of the mixture is constantly maintained at 1ºC. For the ultrasonic precipitation process, the sonotrode of the ultrasonic homogenizer such as the UP200Ht or UP200St equipped with a S26d14 sonotrode is immersed into the solvent-antisolvent mixture. At 100% amplitude setting and 10min. sonication, the mixture dispersed. The sonication time allows for the manipulation of the polymorphism of cucrcumin crystals. When sonication duration is prolonged, the percentage of orthorhombic particles is increased. This indicates that an increase in ultrasonic energy facilitates formation of orthorhombic form over the monoclinic form, irrespectively to the additive used. Since curcumin is lipophilic molecule and poorly dissolvable in water (= hydrophobic), it has a low systemic bioavailability. Therefore, it is necessary to prepare curcumin formulations which enhance its bioavailability. For the preparation of aqueous curcumin solutions, surfactants, lipids, albumins, cyclodextrins, biopolymers etc. are added in order to encapsulate or load the curcumin molecules in liposomes, nanoparticles and other drug carriers. Ultrasonication is a highly efficient and reliable technique to formulate drug carriers such as liposomes, core-shell nanoparticles, biopolymers and double emulsions! Find below an exemplary protocol for the ultrasonic encapsulation of curcumin. First, the PLGA polymer is dissolved in ethyl acetate. Curcumin (15% w/w) is added and allowed to dissolve whilst vortexing the solution intermittently. The solid-in-oil mixture is added to an aqueous phase of PVA (w/v) to form a S-O/W emulsion. Then, the solution of the drug/polymer in PVA is vortexed at 8,000 rpm. The resulting solution is sonicated for approx. 300sec at 45% amplitude with an ultrasonic homogenizer such as UP200Ht or UP200St (200W, 26kHz). Immediately after sonication, the emulsion is poured into the aqueous phase (0.1% PVA in water; 200mL) for diffusion under rapid stirring with a magnetic stirrer. This colloidal suspension is continuously stirred with a magnetic stirrer until the solvent evaporation is completed. Then, the nanoparticles are collected by centrifugation, washed 3 times with distilled Milli Q water. Finally, they are resuspended in cryoprotectent solution (sucrose (2 %w/w) and trehalose (5% w/w)), dried on a lyophilizer ATR FD3.0 system and can be stored at 4°C for at least 6 months. Hielscher Ultrasonics offers high-performace ultrasonic equipment for the synthesis of nanoparticles (e.g. APIs) and extraction of botanical compounds. Our product range includes sophisticated lab, bench-top and industrial ultrasonicators, which allows the development of applications from small to commercial scale. All results obtained in lab and pilot testing can be completely linear scaled to commercial production level. All systems are built for 24/7 operation, robust, and easy to use. The UIPxxxxhdT series embraces our industrial-grade ultrasonic systems, which can be used for bench-top, process optimization and industrial production. Our industrial systems are available as 500W (UIP500hdT), 1000W (UIP1000hdT), 1500W (UIP1500hdT), 2000W (UIP2000hdT), 4000W (UIP4000hdT), 10,000W (UIP10000) and 16,000W (UIP16000, worldwide most powerful ultrasonicator). Hielscher Ultrasonics’ industrial ultrasonic processors can be run continuously 24/7 at very high amplitudes of up to 200µm. For even higher amplitudes, Hielscher offers customized ultrasonic sonotrodes. The robustness of Hielscher’s ultrasonic equipment allows for a reliable around-the-clock operation at heavy duty and in demanding environments. For all our ultrasonic systems, we offer a broad spectrum of accessories such as sonotrodes, booster horns, flow cells and reactors of multiple sizes, shapes and geometries. With these tools, it becomes easily possible to adapt our ultrasonic processors optimally to the required process conditions. For precipitation and bottom-up synthesis, Hielscher offers a unique flow cell insert – the MultiPhaseCavitator MPC48. 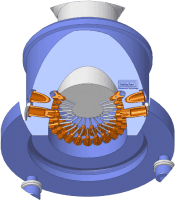 With the MultiPhaseCavitator, the second phase (anti-solvent) is injected via 48 fine canulas directly into the ultrasonic cavitation zone, where it is mixed within milliseconds into the first phase. As result, homogeneous nano-particles are precipitated. Powerful sonication from lab and bench-top to industrial production. Hewlings, S.J. ; Kalman, D.S. (2017): Curcumin: A Review of Its’ Effects on Human Health. Foods. 2017 Oct; 6(10): 92. Thorat, A.A.; Dalvi, S.V. (2014): Particle formation pathways and polymorphism of curcumin induced by ultrasound and additives during liquid antisolvent precipitation. CrystEngComm, 2014, 16, 11102-11114. Ranjan, A.P. ; Mukerjee, A.; Helson, L.; Vishwanatha, J.K: (2012): Scale up, optimization and stability analysis of Curcumin C3 complex-loaded nanoparticles for cancer therapy. Journal of Nanobiotechnology 2012, 10:38. Curcumin is an yellow-coloured chemical compound found in turmeric. Turmeric is a rhizomatous herbaceous perennial plant (Curcuma longa) of the ginger family. Curcumin is a polyphenol which is extracted from the rhizomes and widely used as spice. Depending on its origin and the soil conditions where it is grown, turmeric contains 2%–9% curcuminoids. Curcumin is the main curcuminoid of turmeric (Curcuma longa, Zingiberaceae). It is used as supplement, medicinal compound, food flavoring coloring additive as well as cosmetic ingredient. A purified form of curcumin, which consists only of the following three main components – curcumin, bisdemethoxycurcumin and demethoxycurcumin – is also referred to as curcumin C3 complex. Pure curcumin can be separated from the C3 mix of curcumin, bisdemethoxy curcumin and demethoxy curcumin by column chromatography. Regarding its pharmacological properties, pure, non-modified curcumin has a big problem: Due to is poor water-solubility and thereby poor bioavailability, unmodified curcumin cannot enfold its therapeutic effects, but is rapidly metabolised in the liver and intestinal wall. To overcome curcumin’s low absorption rate, the active molecules are encapsulated in nano carriers (e.g. liposomes, nanospheres) or loaded on nano-complexes (e.g. nanoparticles, complexes of phospholipids, cyclodextrins and solid dispersions). Furthermore, curcumin’s bioavailability can be increased by approx. 2000% when its dosage is combined with piperine, which is a black pepper extract. Due to these facts, nano-formulated curcumin (nanocurcumin) is the preferred dosage form of curcumin since curcumin in nanoform overcomes the afore mentioned drug delivery problems. Nanocurcumin can enfold its therapeutic properties due to improved delivery to the diseased tissue, better internalization and reduced systemic elimination. Curcumin is available in multiple delivery forms including powders, capsules, tablets, ointments, nutritional drinks, and cosmetic creams. Curcumin has been widely investigated for its manifold usage forms in medicine and nutrition. Research has shown that curcumin has a high antioxidant activity, which induces cell apoptosis, inhibits cell proliferation, anti-cell adhesion and motility, and offers anti-angiogenesis and anti-microbial properties. Due to these effects, curcumin is applied as drug to treat various inflammatory diseases, cancers, neurodegenerative diseases, cardiovascular diseases as well as diabetes. Ultrasonically prepared nano-administering forms of curcumin for medical therapy include nanoparticles, liposomes, micelles, nanoemulsions, cyclodextrin complexes, nanodisks, nanofibres, solid lipid nanoparticles, and curcumin conjugates. These nano-sized dosage forms overcome curcumin’s poor bioavailability and allow for the targeted and effective delivery of a highly potent curcumin drug. Curcumin is a symmetric molecule, also known as diferuloyl methane. The IUPAC name of curcumin is(1E,6E)-1,7-bis(4-hydroxy-3-methoxyphenyl)-1,6-heptadiene-3,5-dione, with chemical formula C21H20O6. Curcumin crystals can appear in different shapes, such as monoclinic (acicular), orthorhombic (rice grain like), and amorphous form.